Is Your Small Business Keeping Up with Digital Design Trends? With Apple, Disney, and FitBit among the many customers of their mobile experience and web application design and build services, the Worry Free Labs team is always in the midst of a digital innovation project. When we spoke this week to Paul Choi, president of the New York digital agency whose parent company is PointClear Solutions, he was in the midst his own company’s website redesign. “Every business really ought to be refreshing and improving their site every two to three years,” he said. 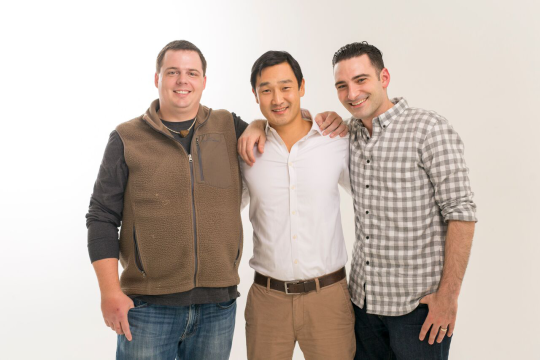 We asked Choi, shown here with Worry Free Labs CTO Thadd Selden (left) and Chief Experience Officer David Issa (right), to share other digital strategy, branding, and design advice their team has for small businesses in 2016. ASB: Why does any business need to refresh its website so often? Choi: Part of the reason is that there are new technologies and ways to market your firm that keep evolving and improving. One of the biggest is Google. You need to keep up with their search and algorithms. It is not easy. You have to do research to keep up with trends from a search engine optimization perspective. You have to know how to be found by customers, such as using certain keywords. It’s more important than ever for a business to make sure its website reflects its brand and vision because the web is so important for customer acquisition. Customers are using the digital platform to find resources. You may not need a full redesign, but you should take a step back and reflect on your site every two years. ASB: For a business with a limited budget, what’s the most important update to make to a website? Choi: Making sure your website is mobile responsive or mobile friendly is a must, and if your site was built on an old platform it might not be. If it’s not, then you’re already getting penalized by Google and the search engines. Websites that aren’t mobile responsive are pushed down lower in search engine rankings than sites that are. Say you operate a bakery. If your website isn’t mobile responsive, then someone searching on Google for a bakery in your area will find your competitor first if his website is mobile responsive. Another quick thing that a company can do is improve the website content. Make sure you’ve got fresh images and text that reflect the business. Descriptive content, such as case studies, is best. Today the trend is toward more visualization than text. Images are more likely to convert leads. You can add good imagery and infographics without having to do a redesign. Look at your content as a whole and make sure it’s as relevant and up-to-date as possible. ASB: What’s new in mobile marketing strategies? Choi: Apps continue to play a big role, especially if you’re a consumer-focused business. A lot of people are spending time on mobile apps versus the mobile web. It’s a trend that continues to flourish. An app might not be appropriate for your business, but some businesses can really benefit. And an app doesn’t have to be custom built. There are a lot of templates small businesses can use to build apps. It won’t be as well designed as you would want for the long term, but it could be an interim solution for companies that need an app asap. ASB: Aren’t people becoming tired of installing new apps on their mobile devices? Choi: There’s definitely a lot more competition today than there ever has been, but that’s the reason for thinking through the strategy. Don’t put an app out there just because you can. Every business is really unique. Some apps do well and some do not. Most companies we work with today are either venture-funded startups or large enterprises. I can’t make apples-to-apples comparisons. But an app was instrumental to the business of KeyMe, a small entrepreneurial startup we worked with that has now raised $20 million. ASB: What trends are you seeing in digital branding? Choi: Some of the tried and true rules still apply. Lean toward the more professional side of things, and, from a design perspective, toward something that’s clean and modern. A lot of companies need to refresh old branding, but make sure you’re not alienating customers. Try a slight improvement in branding without a total overhaul. ASB: Any other trends you’re seeing emerge in digital marketing? Choi: Enhancing customer engagement is another trend we’re seeing. We’re helping one of our clients in the education space make sure it’s retaining students by keeping them engaged in school. And we’re seeing patient engagement activity in the health care space, where apps are designed to get patients to better engage with providers. Prizes, points, and rewards programs are other ways businesses are trying to keep customers motivated and sticky. I see a lot of companies do it well, but it’s not for every business. There can be a big infrastructure cost to put that in place. There’s also a lot more animation coming into play today–not only GIFs, but more animation in mobile and web to further engage users. Say you’re trying to show the work you do through a case study. Instead of a static image, you can share an animated case study that shows off the work better. It really pops off the screen. You can see the work’s progression better than with a static image. ASB: What about design trends that have faded? Choi: I don’t think anybody is using Flash any more. That’s a big no no. Also it’s important to pay attention to what we call “above the fold.” There are a lot of different screen sizes and you want to capture your users’ attention without making them scroll down the screen. You’ve got to hit them with the most relevant content right there so they’ll have a reason to scroll down. ASB: One last word of advice for small businesses? Choi: It’s important for small businesses to invest in digital marketing, a website, and a mobile presence. Today, people are finding their partners and businesses are finding their customers through digital channels. It does take an investment. The key is spending your dollars wisely. Think of it from a return on investment standpoint. It can be a big cost, but what’s the opportunity cost of not investing in digital?